Last summer I was fortunate to be able to purchase Silhouette CAMEO® electronic cutting tool to use in making my crafts! One of my two grown daughters already had CAMEO and I had been wanting one for several months, so needless to say I was very happy when I got my very own CAMEO! My other daughter was the first to acquire an electronic cutting tool; but hers is a different brand. After using both, we all prefer Silhouette CAMEO®. My daughter told me just this week that after using CAMEO she now wants to get her own, because it can do so much more than the electronic cutting tool she has. My daughters and I enjoy crafting together and sharing ideas and collaborating on our creations. As soon as I got CAMEO, I went right to work making all kinds of fun projects. Gifts for family and friends, home decor items, novelty clothing appliqués, and holiday craft items are some of the fun things I was able to make. Here are pictures and descriptions of my top five favorite projects that I wanted to share with you. 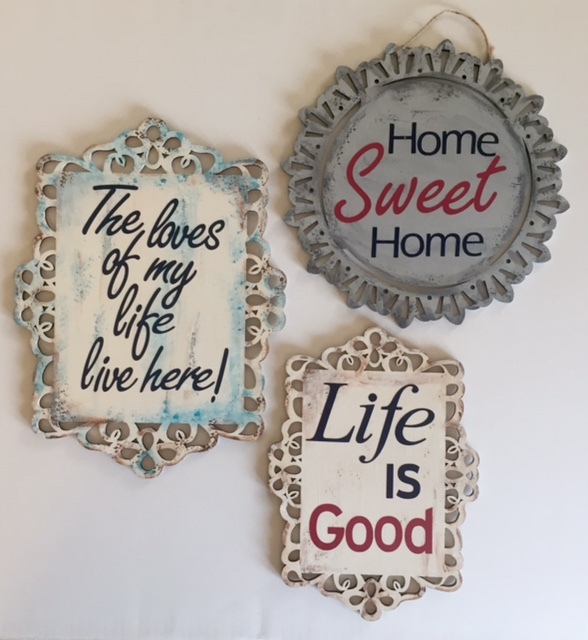 #5 – This set of three mini canvas’ makes a great Easter decoration. I made this by painting each canvas a bright color and choosing a coordinating piece of scrapbook paper to glue to each canvas. I drew the outline of a lamb, a bunny, and a chick. I scanned my drawings into my computer and imported them into the CAMEO library. Then I was able to trace the figures, save them to the library and send them to CAMEO to be cut. Finally I glued the figures to the papers on the canvas’, sprayed them with a clear coat and added the embellishments. The finished product turned out to be pretty cute and festive, if I do say so myself! #4 – These wall hangings with inspirational sayings are my fourth favorite project. I love the modern colors and the moving words. CAMEO cuts out letters in my choice of fonts on my choice of color coordinated vinyl to make each plaque just right. They make a great addition to a family photo grouping on any wall! 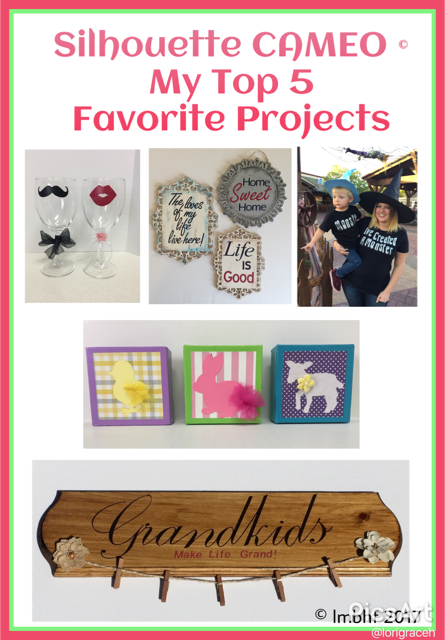 #3 – Any grandparent would be proud to display photos of their grandchildren on my third favorite project. Fancy letters cut with CAMEO spell out “Grandchildren,” while smaller, more subtle letters spell out “make life grand” in a contrasting color. Just clip photos of the grandkids to the mini clothes pins for a sweet display! 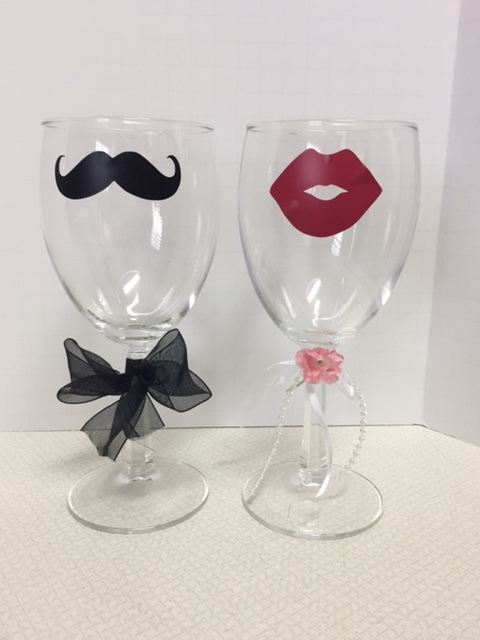 #2 – My second favorite project is this adorable set of his and hers wine glasses adorned with a mustache and lips! They are just the thing to add some whimsy to a wedding, Valentine’s Day, or a romantic dinner. And finally . . . DRUM ROLL!!! #1 – My very favorite project made with CAMEO is this cute set of Halloween shirts made for my daughter and grandson. My daughter’s shirt says, “I’ve Created a Monster” and my grandson’s shirt says, “Monster.” How cute is that?! I also had to include a photo of the tank top I made when my daughter was pregnant for Independence Day. 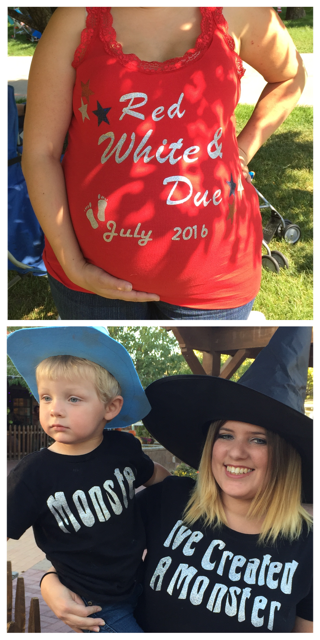 It reads, “Red, White and Due – July 2016” in honor of my new granddaughter. And there you have it, my top five favorite Silhouette CAMEO® projects! I’m happy with how they turned out and pretty proud of them too and I had oh so much fun making them!! Here are some related products you might like. Click on the photo or the description to be directed to Amazon where you can purchase the items. I like your projects! I have a Cricut and went crazy making things for the grandbabies when I first got it – t-shirts, sippy cups, totes and more. Thanks Lori from Grammy Dee, #WednesdayAIM #LinkUp #BlogParty, social media shared.